This presents an excellent opportunity to acquire a unit currently used as a portable office with the inside divided into a foyer, two good offices, a storage room/kitchen and wc. The unit would need to be moved to the purchaser's own location at their expense. This unit is subject to VAT. 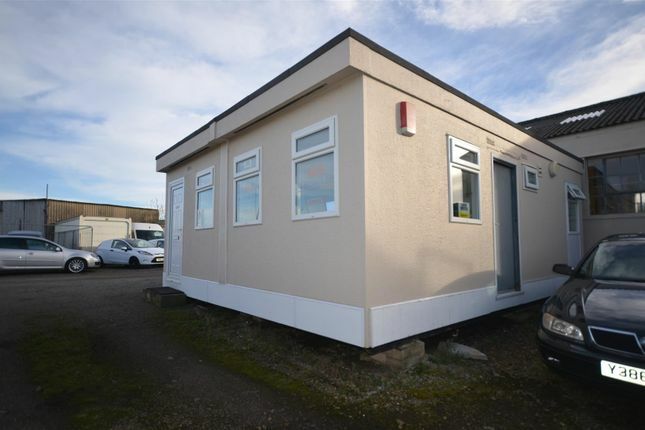 This presents an excellent opportunity to acquire a unit currently used as a portable office with the inside divided into a foyer, two good offices, a storage room/kitchen and a wc. The property has an alarm system. Currently at Forge Industrial Park in Camborne, the unit would need to be moved to the purchaser's own location at their expense. The vendor, who runs a truck business, has intimated that he would know somebody who take it to your location. We are told that it splits down the centre line into two rectangular units. We would suggest that this is very suitable for perhaps car/van sales, a builder's site office or perhaps somebody who would like to work from home. It had a new roof in December 2012 with a 15 year guarantee. There are panel heaters, telephone points and of course electric points. It would be ready to take water and electric with the buyer sourcing their own drainage. The overall dimensions of the property are 7.18m x 5.80m (23'6 x 19'). Leave the A30 at the first Camborne exit and at the large crossroads turn right towards Camborne and through Tuckingmill. Proceed up the hill and turn right by the pelican crossing into North Roskear Road. Take the next right and then the second left into Boiler Works Road where you will see Forge Industrial Park on your left hand side. This unit is subject to VAT. Property descriptions and related information displayed on this page, with the exclusion of Running Costs data, are marketing materials provided by Bill Bannister, and do not constitute property particulars. Please contact Bill Bannister for full details and further information. The Running Costs data displayed on this page are provided by PrimeLocation to give an indication of potential running costs based on various data sources. PrimeLocation does not warrant or accept any responsibility for the accuracy or completeness of the property descriptions, related information or Running Costs data provided here.